Notes: Use the SPLITComPro to split or combine balanced low impedance microphone signals. 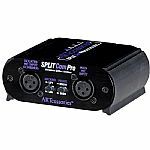 As a splitter: the SPLITComPro provides one direct-coupled output and one isolated output from a single microphone. Applications include sending the direct output to the main or FOH mixer, and the second isolated output to a monitor or recording mixer. The main mic output passes phantom power from the main mixer to the amin mic input for use with condenser microphones. The Phantom power is blocked from passing to the isolated mic output. Aa a combiner: The SPLITComPro provides one output from 2 microphone inputs. The phase switch can be used to invert the relative phase of the isolated mic input. Applications include dual micing of percussion instruments, choirs, and instrument amplifiers. The Phantom power passes through each output to their respective input, (main to main, isolated to isolated), however the phantom power is blocked from passing between the main and isolated signal paths. Only the audio passes between the main and isolated signal paths (it is present on all inputs and outputs). Notes: The TransX two channel microphone preamplifier features a new low noise discrete transformer coupled high performance preamplification circuit. Building upon the quality and success of great sounding products like the Pro MPA II and the Pro VLA II, ART engineers set out to develop the next generation of professional microphone preamplifier to complement our tube-based preamps. The TransX sets a new standard for quality and value. Professional features and spectacular tone are what make the TransX a world-class microphone preamplifier. Notes: Whether you're working with a computer, hard disk or digital multi-track recorder, the Tube MP's TEC award nominated design will allow you to obtain professional results at an affordable price. The ART preamps offer warm tone, useful features and are innovatively designed. ART's line of Tube MP products add presence, clarity and fullness to any signal and is exceptionally low noise. 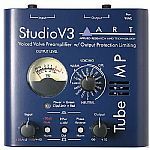 The ART Tube MP Studio V3 features V3 Technology (Variable Valve Voicing), which provides optimized reference points to begin the recording process. The V3 delivers a wide variety of settings designed for various microphones and DI inputs, including guitars, basses, keyboards, synths, electronic drums and much more. Don't settle for a copy cat look alike. Go with the real thing, the Tube MP by ART. Notes: Getting the band together or even practicing by yourself isn't always easy. Conflicting schedules, space restrictions, and perhaps most importantly, not bothering your family and neighbours, are just a few of the factors that can hijack a jam session. 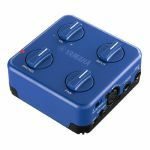 SesssionCake is the affordable, ultra-portable, and flexible solution for aspiring musicians who don't have the time, the money, or an appropriate space to really cut loose when they practice alone or jam with friends. Connect an iOS device as an effector or to play along with your favourite tunes, or link together up to eight units for a full-blown jam session with your friends or bandmates. No money, no time, no space? No problem - SessionCake has got you covered. SessionCake SC-02 adds vocalists, keyboardists, and digital instruments to the mix with XLR and stereo left (mono) and right (Hi-Z) inputs, as well as a GAIN (MIC) control for dynamic microphones.